Stronger winds out in the Panhandle (to 35 MPH) have that part of the state under a Red Flag Warning. Notice the “critical” Fire Weather Outlook from the National Weather Service for that part of the state today. We won’t let our guard down though, as part of North Texas is in the “elevated” category. We’re getting into that time of year when the wildfire concern increases across North Texas. Of course, the wind is mostly to blame. March is notorious for windy days across the Plains as the jet stream transitions farther south and areas of low pressure quickly develop out west. While the increase in wind is the primary driver to the wildfire danger, low humidity is a close second. The critical humidity threshold is about 20 percent. When the humidity drops below this level the wildfire danger skyrockets, especially on those windy days. Warm weather and dry soil conditions also factor in. March generally sees a culmination of all of these ingredients, with higher winds and temperatures leading the charge. Furthermore, much of the landscape is still in the final stages of dormancy, thus producing a tinderbox waiting to ignite. The wildfire season generally lessens slightly in April in May as the humidity returns along with the spring rains and resulting “green-up” of vegetation. Late summer and fall often brings a return of wildfire conditions with low humidity and stronger winds once again. Fortunately for today (Friday), the wildfire danger is not critical in North Texas. This is primarily because the wind is only expected to be in the 5 to 12 mph range. However, stronger winds out in the Panhandle (to 35 MPH) have that part of the state under a Red Flag Warning. 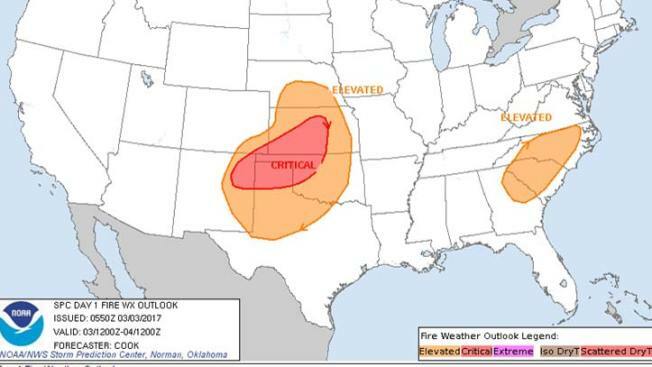 Notice the “critical” Fire Weather Outlook from the National Weather Service for that part of the state today. We won’t let our guard down though, as part of North Texas is in the “elevated” category.